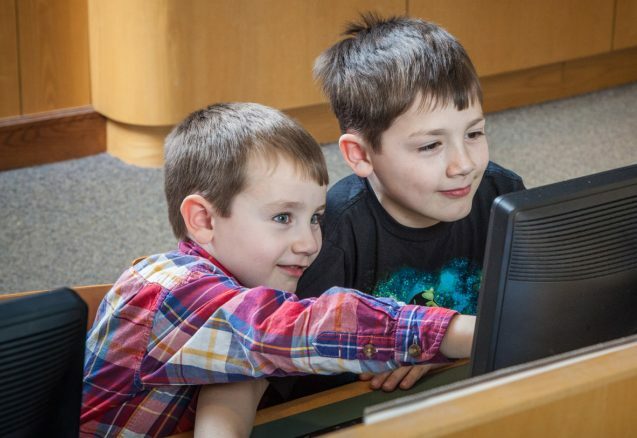 eLibrary is the Nevins Library’s digital collection for children, and is open 24/7. Start your information quest by clicking on a topic, arranged in two categories: Databases and Websites. Have fun exploring this information! To use a database, you will need to enter your 14 digit library card number (no spaces). Call 978-686-4080 ext. 26 if you need assistance. To use the list of websites on the topic, click on the link. If you have a library card from other Massachusetts public libraries, you will be able to access some of these resources, but not all. A comprehensive reference resource with components for students of all ages. A dictionary, a thesaurus, multimedia, and primary source materials. Interactive learning for ages 4 to 7 that is fun and developmentally appropriate. Kids InfoBits geared toward K- 5 students, provides full-text articles from magazines and reference books. Full-text magazines, newspapers and reference books for junior high and middle school students covering current events, the arts, science, popular culture, health, people, government, history, sports and more. Find information about a wide variety of subjects for homework. Site includes a dictionary, thesaurus, almanac and games. This online encyclopedia is for kids ages 7 to 11. Lots of great content, pictures, sound clips and videos. This focus of this collection of digital books for children is to offer a library of outstanding literature from all over the world. There are books available in almost 20 languages. The entire True Book series covers subjects in social studies and uses videos, audio, images and text. Explore more than 4,900 years into the past. You will find hundreds of articles about people, events and topics in World History. This contains information on hundreds of the most significant people, events and topics in U.S. History. Find factual information about famous people (past and present) alongside magazine and journal articles, primary sources, videos, audio podcasts, and images. Learn how to speak a different language using a self-paced program. Choose from more than 72 different languages. Short biographies of our nation’s First Ladies. This focuses is on individuals who have shaped the 20th century by their accomplishments. Read short biographies about women who work at NASA. Selected profiles are available in Spanish. Science related information from magazines, academic journals, news articles, experiments, images, videos, audio files and website links.